Damn Small Linux Plus XAMPP to Create WordPress Virtual Appliance has advantages with a footprint of less than 100MB in size, you can upgrade to Debian later. If you are not aware of the fact that WordPress Virtual Appliance can deliver you all the features of localhost installation, you might find this linked article useful. Damn Small Linux or DSL is a ~50MB distro and perfect to create a handy Virtual Appliance. If you are new to the word Virtual Appliance – there is nothing to fear about. It is practically running an Operating System on any kind of basic Virtualization software like Free VirtualBox and installing Custom components (like XAMPP plus WordPress in our example) and saving it as image file. Please note that, you will have to allocate a disk space to save the image (in our video we have used the option NOT to save any image as it is for test purpose). You can read how How Virtual Appliance Works to understand the theoretical part. The below video shows how to run Damn Small Linux on VirtualBox (on MacBook Pro 15″). 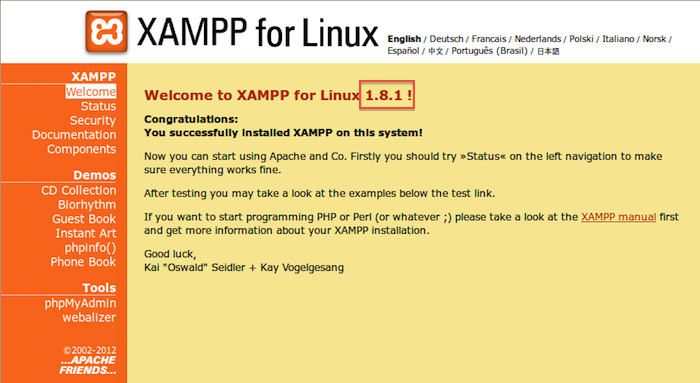 Note that the XAMPP installation part has not been shown, that part is written here. Normally use XAMPP. There is nothing to explain how to use XAMPP to install WordPress. It is basically same like in Windows – you can read if you are a newbie. This will make XAMPP to start every-time you start the saved image. This Article Has Been Shared 2275 Times! Using Virtual Appliance on VMware Fusion or VirtualBox is a great way to test any Framework, Database, CMS including WordPress just like using localhost. How To Create Virtual Appliance to run Newest Version of any Web Software like WordPress latest version of WordPress to test it on VMware Fusion or VirtualBox ? Installing WordPress via localhost Virtualization on Guest OS is a practical, robust and clean way to keep your development or backup of WordPress organized. Cite this article as: Abhishek Ghosh, "Damn Small Linux Plus XAMPP to Create WordPress Virtual Appliance," in The Customize Windows, April 13, 2013, April 21, 2019, https://thecustomizewindows.com/2013/04/damn-small-linux-plus-xampp-to-create-wordpress-virtual-appliance/.